The video revolution has been a long time coming, and by now most people have an inkling what to expect. Broadcast television, cable, VCRs, and video games have prepared us for the technological and commercial possibilities of the medium, its convenience as a conveyer of information, and its adaptability to arcade entertainment. But what is the artistic potential of video? What doors to the imagination can it unlock that remain closed to other media? A few experimentalists are exploring the aesthetic innovations new technology makes possible, and the results – Jean-Luc Godard’s Numero Deux, for example, or the appearances of performance artist Laurie Anderson – are exciting, indeed. Joining this cadre of pioneers is the New York-based theater collective Mabou Mines, whose hour-long piece Hajj marks one of the first attempts to integrate video and live performance. Shown in open rehearsals at the Performing Garage in New York and performed as a work in progress at the American Film Institute’s National Video Festival last June, Hajj is a athree-way collaboration. Based on a poem by Lee Breuer, it is performed by Ruth Maleczech, and the video elements are conceived and designed by Craig Jones, who, although not a Mabou Mines member, has worked on video projects (The Lost Ones, B. Beaver Animation) and live production (Wrong Guys) with the collective in the past. Breuer and Maleczech are founders of Mabou Mines, whose productions over the years have varied as widely as the interests of its members. The shows range from exquisitely acted renditions of Samuel Beckett’s minimalist prose, to original compositions by Breuer, to JoAnne Akalaitis’s multimedia “history of nuclear power,” called Dead End Kids. In experimental theater circles, the name “Mabou Mines” conjures up bravura performance supported by high-tech stagecraft – the thinnest of threads to tie together the company’s diverse repertoire, but in practice a sturdy trademark. This may sound like perfervid conceptual-art theorizing, but in viewing Hajj, one understands the lyricism in Breuer’s abstruse analogy. The actress Maleczech sits down at a vanity table, her back to the audience. She faces a triptych of tall, ornately framed mirrors and begins to apply an elaborate makeup. When she reaches for a hairpiece, a video monitor suddenly reveals itself behind one of the mirrors and a closed-circuit camera zooms in on the hairpiece. As she continues putting on her makeup, monitors behind the other two mirrors flicker on, picking up similarly specific images – a necklace, the smoke from her cigarette. The actress murmurs the text (picked up by a high-powered body mike) as the screen images float alongside her reflection in the mirror, and these are soon joined by another layer of imagery. Filmed sequences showing a child on the lap of an old man and a truck driving through a barren landscape are superimposed on closed-circuit images of Maleczech’s face or objects on the makeup table. As suddenly and magically as they appear, the video pictures periodically drop out altogether, leaving a woman alone at the mirror with her reflection instead of – her dreams? her memories? her soul? The collaborative conception of the piece meant that it was up to Maleczech to supply the “memories,” and she chose a trip she took as a child with her father in an army truck as the basis for the prerecorded video. 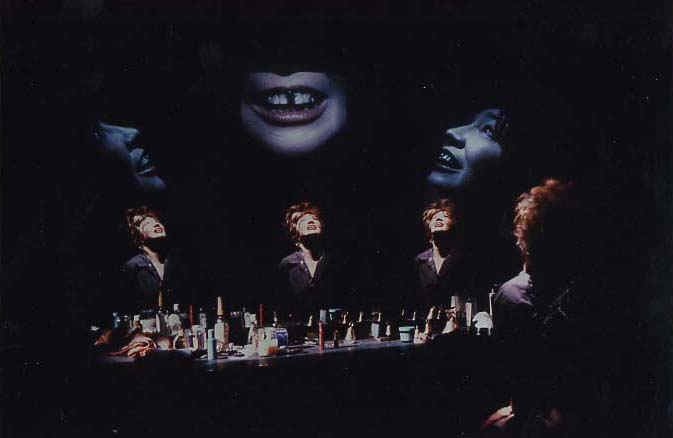 Videographer Craig Jones, meanwhile, came up with the idea of setting the piece at a vanity table, using two-way mirrors to make the video a metaphor for observing oneself. “We also had in the back of our minds the Dorian Gray idea that the image of oneself changes in relation to one’s spiritual position,” says Breuer. The best thing about Hajj, in fact, is that live element. For all its sophisticated grasp of video technique, the piece derives its strength and simplicity from Maleczech’s performance. An unprepossessing woman offstage, Maleczech is an almost disturbingly powerful actress. Her voice is even, her gestures meticulous and understated, but under the lights she becomes a witch harboring secret, unpredictable forces. Her wide, alert face expresses an inscrutable calm. This live essence is what distinguishes Hajj from other video pieces. Breuer compares the work to the excerpts from Robert Ashley’s “video opera” Perfect Lives (Private Parts), which John Sanborn and Kit Fitzgerald have exhibited, while Maleczech cites Laurie Anderson’s performances and Joan Jonas’s Organic Honey’s Vertical Roll. None of these, however, utilizes live performance and closed-circuit video and prerecorded video. The fact that Hajj uses all three is the source of its originality, but it’s also the source of the piece’s almost impossible technical demands. Breuer and Maleczech have had to rehearse the performance with rough cuts of prerecorded video, which means mixing the video live. “Every time you change the timing of something, you have to reedit,” says Breuer, “and for just a few minutes that can run $3,000. It’s mind-bogglingly expensive.” Lighting also becomes a problem. “You have to have enough light so that the live photography is sharp and clear and color-true,” Maleczech points out, “but you can’t have so much light that the video fades out. And you have to be able to isolate the dramatic element.” The solution that they found works best is to use tiny localized spotlights, and, with better cameras, they have been able to use less and less light. Without backing, they had to begin work with a Betamax and one monitor, borrowing whatever equipment they could find and editing whenever someone offered them free studio time. But in order to finish creating and rehearsing Hajj in time for the planned New York opening at the Public Theater in April, they are almost entirely dependent on the willingness of the Sony Corporation to loan them a truckload of equipment for at least eight weeks. And if the work is to have a life after that, it will have to tour places already equipped with video facilities. Luckily, the increase in university media centers makes that a good possibility. Now there’s an imaginative approach to video.